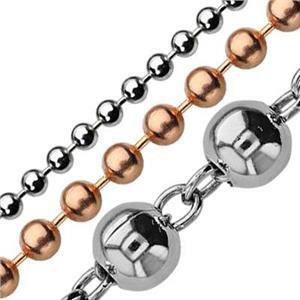 Copper or sterling silver bead chain footage in bulk spools. Shop online now! 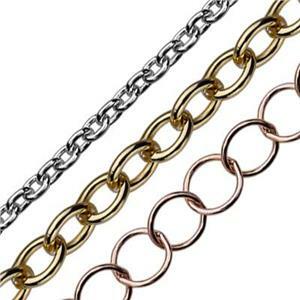 Bulk sterling silver, gold filled or copper cable jewelry chains by the foot. Check it out! 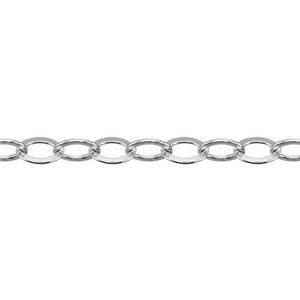 Curb chain bulk footage in sterling silver or gold filled. Buy short lengths or spools now! Drawn cable jewelry chains in sterling silver or gold filled. Bulk spool lengths or by the inch. Flat Cable Jewelry Chains in bulk. 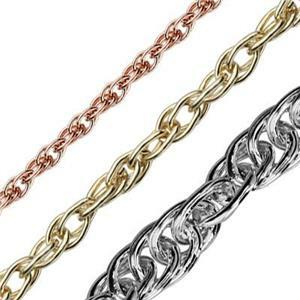 See our huge selection of silver and gold chains! 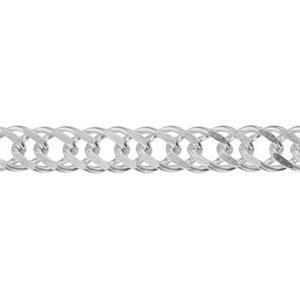 Textured jewelry chain footage with hammered or knurled patterned links. Sterling & gold filled! 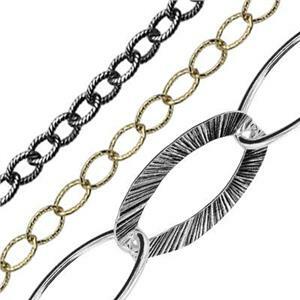 Large fashion jewelry chains in sterling silver or gold filled. Cut to order! 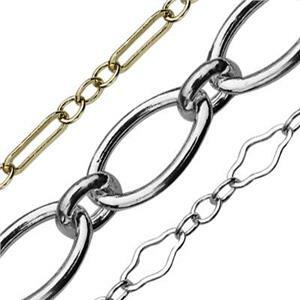 Long & short jewelry chain footage with alternating links. Sterling silver & gold filled options! 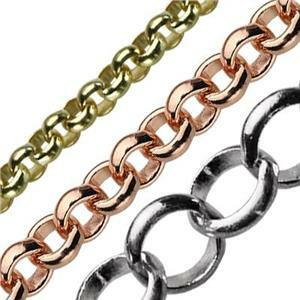 Fancy jewelry chains in bulk sold by the inch or foot. See price breaks for quantity discounts. 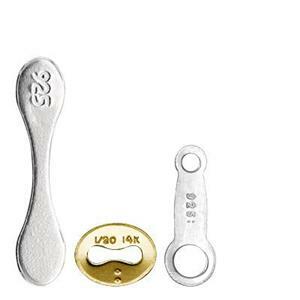 Quality hallmark tags for finishing jewelry with a stamped material disclosure. Inform your customers! 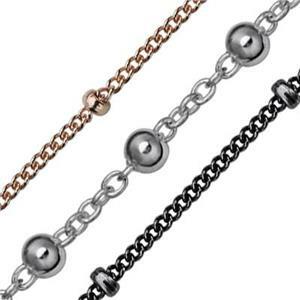 Rollo jewelry chain footage in sterling silver, gold filled or copper. Many sizes! 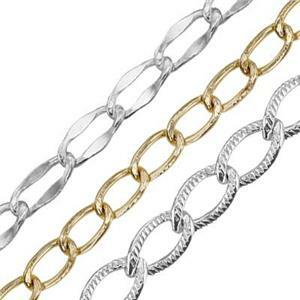 Double rope and spiga wheat style chains in sterling silver or gold filled. Browse now! Saturn jewelry chain or rosary beaded chain by the foot in sterling or gold filled. Visit our Jewelry Chain Information page for resources on chain for your studio. 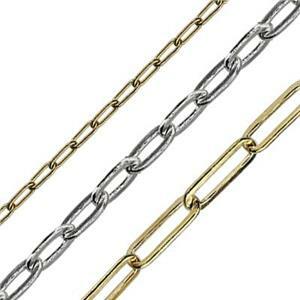 Bulk jewelry chain footage is sold by the inch or by the foot. 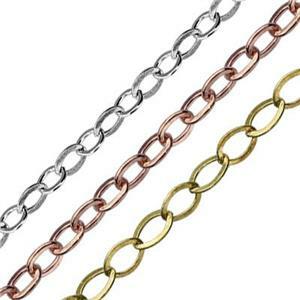 We have large selections of sterling silver chains and gold filled chains for jewelry making studios. Shorter lengths are bundled or carded. Longer lengths are spooled. Most footage chains are sold in 12 inch minimum quantities unless a 10 foot minimum is noted. Maximum price breaks available on 100 foot spools. Spooled lengths are sometimes segmented at the factories so we cannot guarantee continuous lengths. Base prices are shown below. Click on items to see details and quantity break price tiers. 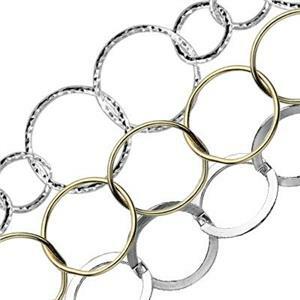 Be sure to shop our huge selection of jewelry making findings to use for chain finishing such as jump rings, jewelry clasps and embellishment options. 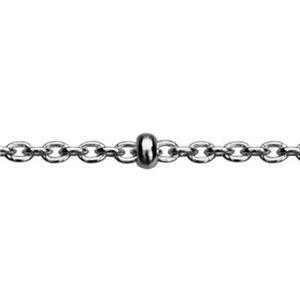 See our blog for helpful articles on how to finish chain ends and our glossary of link styles.